[L-R] Past Chair of the Central Florida Sports Commission, Mike Millay; City of Orlando Mayor Buddy Dyer; Midfielder for the Fort Lauderdale Strikers and Co-Captain of the Haitian National Team, Jean-Marc Alexandre; Midfielder and Forward for Orlando City Soccer Club, Julio Baptista; Orange County Mayor Teresa Jacobs and President of Orlando City Soccer Club, Phil Rawlins celebrate Copa America Centenario at Camping World Stadium. 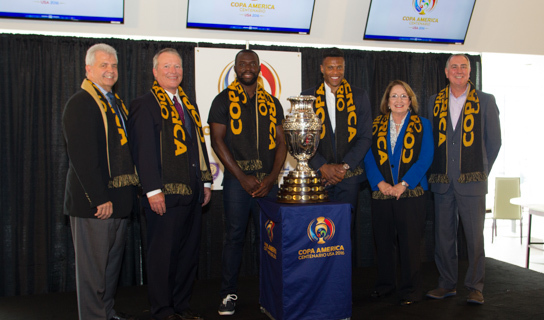 Orange County continues to be the nation’s premier destination for soccer with the recent announcement that Camping World Stadium will host the 2016 Copa America Centenario Tournament in June. Orange County Mayor Teresa Jacobs, City of Orlando Mayor Buddy Dyer, Central Florida Sports Commission Board Member Mike Millay, Orlando City Soccer Club President Phil Rawlins, Orange County District 6 Commissioner Victoria Siplin and key community leaders recently gathered at a press conference to celebrate the announcement. This year marks Copa America’s 100th anniversary and the first time the tournament has been hosted outside of South America. Orlando is one of 10 U.S. host cities and the only city in the South to host Copa America. Camping World Stadium will host the first of three Group Stage matches on June 4, 6 and 8. Copa America is estimated to have an economic impact of $30 million with approximately 40,000 room nights at local hotels. Matches will be internationally televised on FOX and Univision, showcasing Orange County and all it offers to a global audience. Soccer superstars Julio Baptista, forward and midfielder for Orlando City Soccer and Jean-Marc Alexandre, co-captain of the Haitian National Team and member of the Fort Lauderdale Strikers, also joined in the celebration. Soccer has quickly grown in popularity and passion throughout the U.S. and specifically in Orlando. Nicknamed “Soccer Capital of the South,” the Orange County region has emerged as a top American soccer destination thanks to Orlando City Soccer, Orlando Pride, U.S. Women’s National Team vs. Brazil in 2013 and 2015, Mexico vs. Costa Rica friendly in 2015 and now Copa America. Soccer enthusiasts contend that the upcoming tournament will be the biggest sporting event in Orlando since the 1994 World Cup matches. Sixteen teams from the Confederation of North, Central America and Caribbean Association Football (CONCACAF) and the Confederación Sudamericana de Fútbol (CONMEBOL) will be competing in the tournament throughout the U.S. from June 3 through 26. Copa America kicks off in Santa Clara, Calif. on June 3 in a match between USA vs. Colombia. To view photos from the Copa America Media Day, visit Mayor Jacobs’ Flickr album.